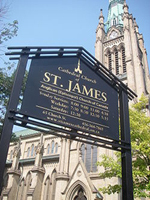 The Anglican parish of St. James was established in 1797. In 1807, the first "church of York” was built in Toronto out of wood. As a young structure, it was used in 1813, during the War of 1812 as a hospital. It was robbed and damaged by the American troops. Shortly after, in 1818, the church was enlarged and a bell tower addition was completed. This bell was used as a fire bell for the town of York. In 1833, the wooden structure was taken down and replaced by a stone structure in the Neoclassical style. In January 1839, the church burned down and was reconstructed. Upon reopening in December 1839, the church became a Cathedral. St. James Cemetery, the parish cemetery, was moved in the 1840s to St. James-the-Less at Parliament and Bloor, although there are still unmarked graves under the modern parking lot. In 1849, the Cathedral was destroyed in yet another fire. An international architectural competition was held to replace it, drawing eleven entries from Canada and the United States. Frederick William Cumberland and Thomas Ridout's Gothic Revival design placed first, followed by the submissions of John Ostell and Kivas Tully respectively. Construction began on 1 July 1850, and the Ohio stone and brick Cathedral was opened to the public in 1853. The church's original organ was built in 1853 by Samuel Russell Warren. Kensington Market). It is located on the southwest corner of Front and Lower Jarvis Streets. It was established in the early part of the city's history and was once home to Toronto's first permanent city hall and jail house from 1845 to 1899. It was designed by English immigrant architect Henry Bowyer Lane, who also designed Little Trinity Church in 1843, Holy Trinity Church in 1847, and expansion of Osgoode Hall in 1844. Lane incorporated his design with Georgian tradition style using white stones and red brick wall. A “cupola” was built on the top front side of the building with a clock. The first floor was formerly Police Station #1. The south building is located at 92 Front Street East, contained by Market Street, The Esplanade, Lower Jarvis, and Front Street. Currently, it is one of the major markets in Toronto’s downtown core. Over 50 vendors sell fruits, vegetables, meats and cheeses on the lower and first level. The building also has The Market Gallery, operated by City of Toronto, on the second floor and a cooking school (market kitchen) on the mezzanine floor. 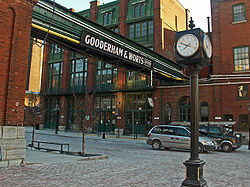 The Gooderham and Worts Distillery was founded in 1832, and by the late 1860s was the largest distillery in the world. Once providing over 2 million gallons of whisky, mostly for export on the world market, the company was bought out in later years by rival Hiram Walker Co., another large Canadian distiller. Its location on the side of the Canadian National Railway mainline and located at the mouth of the original route of the Don River outlet into Lake Ontario which facilitated transport connections to the rest of Canada and indeed the world, and the entire area was once the industrial centre of Toronto and transhipping hub.